Resource collisions occur when a resource exceeds 100% for particular day (each day equals one collision). The red collision notification is displayed at the top of any app page and is only visible when collisions exist. The example below demonstrates a new assignment that triggers a new resource collision. * Moments after the new assignment is created the system recognizes the resource exceeds 100% capacity for one or more days. Clicking the collision notification icon opens the collision summary page. The collision details page allows users to eliminate ‘double-parked’ situation by swapping resources. *A more typical example is when a new project is created from template or imported from a 3rd party app. Suppose you have 10 projects in a dependency chain. If Project 2 (upstream) shifts out by a week, but Project 3 (downstream) is fixed — meaning the relationship between the upstream project end date a the downstream project start date is locked — then moving Project 2 violates the fixed relationship. The result is a fixed project collision that is tracked and measured in the collision report. 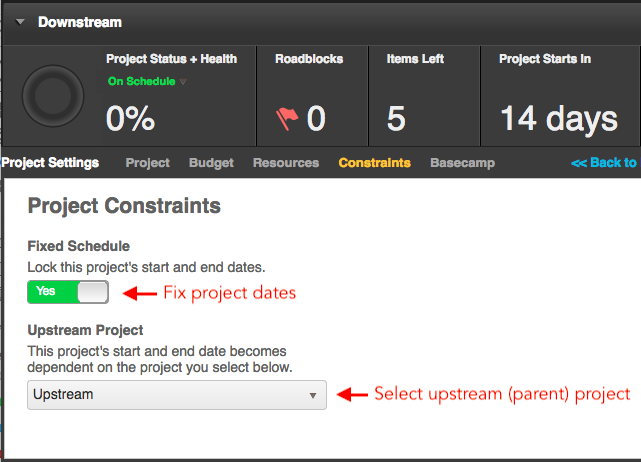 To create a fixed project dependency, go to Project 360 > Settings > Constraints and fix the project start/end dates, then select its upstream project. Note: Creating an upstream-downstream project relationship automatically creates a project group on the Projects Tab > Gantt view. Suppose you have 10 projects in a dependency chain. If an upstream shifts out by a week, it will shift downstream projects by the same number of days. In that case, the system will alert the user who shifted the upstream project that downstream (dependent) projects are impacted. 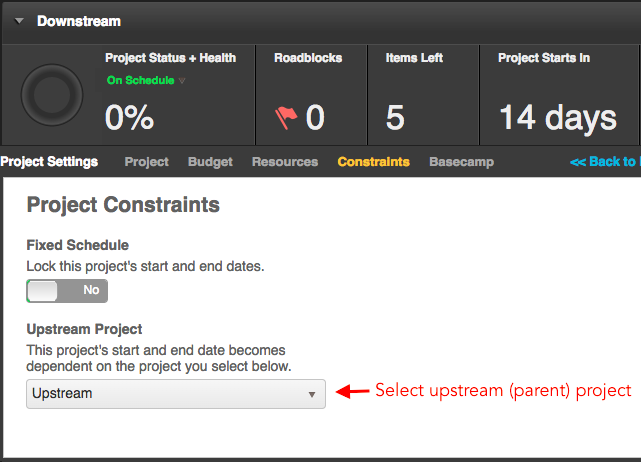 To create a project dependency, go to Project 360 > Settings > Constraints and select its upstream project. Note: Creating an upstream-downstream project relationship automatically creates a project group on the Projects Tab > Gantt view. 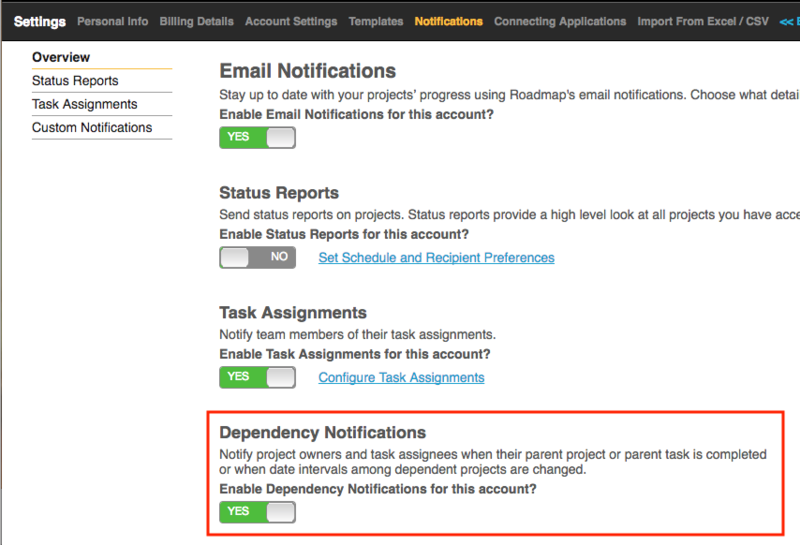 Dependency notifications will send emails to downstream project owners and task assignees if changes to an upstream project dates impacts them. The notifications will also notify downstream project owners and task assignees when their parent project/task is marked as completed. Go to Settings > Custom Notifications to enable this feature.